MEXICO CITY (AP) (KFSN) -- Furious at spiraling corruption and violence, Mexican voters appeared to have unleashed a political earthquake Sunday by electing a leftist firebrand and giving him a broad mandate to overthrow the political establishment and govern for the poor. 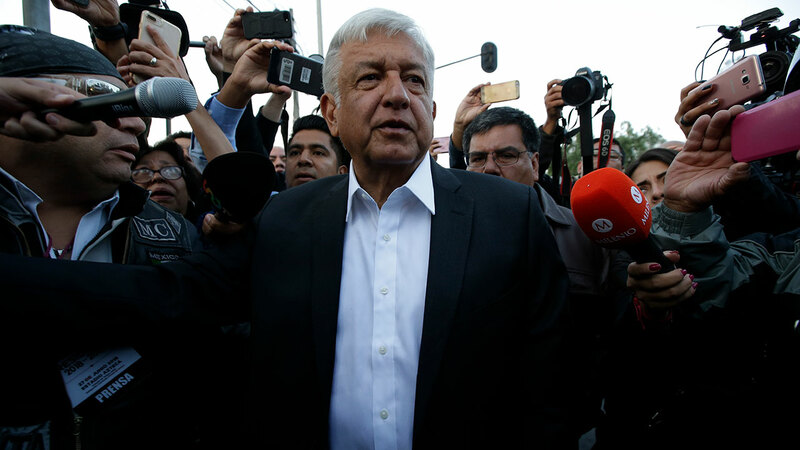 A prominent exit poll gave populist Andres Manuel Lopez Obrador a 16 to 26 point lead over his nearest rivals, who conceded even before official results were released by the National Electoral Institute. And his party allies were predicted to have huge wins in the Senate and lower house, possibly absolute majorities in both. Lopez Obrador, who vowed to transform Mexico and oust the "mafia of power" ruling the country, rode widespread voter anger and discontent with the governing Institutional Revolution Party, or PRI, of President Enrique Pena Nieto and had led opinion polls since the beginning of the campaign. Conservative Ricardo Anaya of a right-left coalition and the PRI's Jose Antonio Meade acknowledged defeat shortly after polls closed nationwide. Lopez Obrador waved to supporters from a balcony of his campaign headquarters and then left in a motorcade for the center of the capital. Supporters began wild celebrations in Mexico City, cruising up and down the central Paseo de la Reforma boulevard honking horns to the tune of "Viva Mexico!" and waving Mexican flags from car windows and moon roofs. Thousands poured into the sprawling main square known as the Zocalo, where the 64-year-old former mayor had called on his backers to rally Sunday night. Many danced to the trills of mariachi music. Mitofsky predicted Morena allies would take between 56 and 70 seats in the 100-member senate and between 256 and 291 spots in the 500-seat lower house. "Now that he has won, he cannot fail this new generation that believes in him," said Mariano Bartolini, a 29-year-old lawyer who voted for Lopez Obrador in the northwestern city of Tijuana, across the border from San Diego. "It is thanks to us young people who are supporting him that he was able to get more votes than he did in past elections." Casting his own vote Sunday, Pena Nieto promised to work on the transition with whoever won. "The president of the republic and his government will be absolutely respectful and support the authorities that are elected," the president told reporters. Sunday was the first time that an independent candidate appeared on the ballot. It was also the first time Mexicans living abroad were able to vote for down-ballot races like senators. More than 181,000 received ballots and the 97,000 that the National Electoral Institute had gotten back by Friday morning were already double the number received in 2012.